The persistent line of algae and scum that grows in the splash zone just above the waterline used to be one of most annoying problems we had on Momo. The tenacious stuff could only be removed by vigorous scrubbing with a scouring pad, which took off the gelcoat as well. So the last time we hauled out, we tried something new. 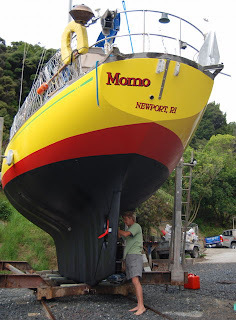 Instead of using a regular polyurethane paint for the bootstripe, we bought a can of Petit’s Vivid bright red anti-fouling paint and rolled on a 12" stripe between the bottom and the topside. Now all we need to do to clean the waterline is go sailing. We haven't scrubbed the waterline since. The only disadvantage of the paint is that it rubs off on the dinghy. But it's worth pointing out that one-part topside paint also rubs off (we know this from painting our first boat), and the Vivid is much easier to replace. That is amazing and good to know. Thanks for the tip. I'm pretty sure we'll give it a try next spring when we haul out. Our boottop is a bit patchy from scrubbing and the area above is definitely a bit tatty. This looks like a solution. I don't think it hurts to have a ratty looking dingy, stops it being stolen!